So I thought I'd show you the less charming, more modern side. The side of the city I usually see. Honestly, I like this part, too. It's just not the most photographed. 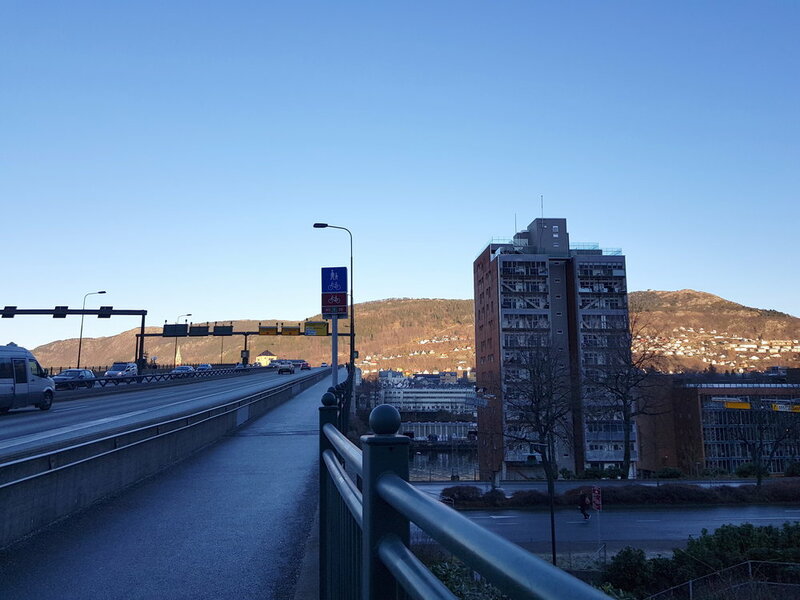 Bergen is a constantly growing city. The population has doubled to 250 000 in the last 40 years. As for most cities, at some point you can't expand out; you have to start expanding up. So we've been seeing more and more taller buildings, although not in the city center itself (regulation rules and stuff). 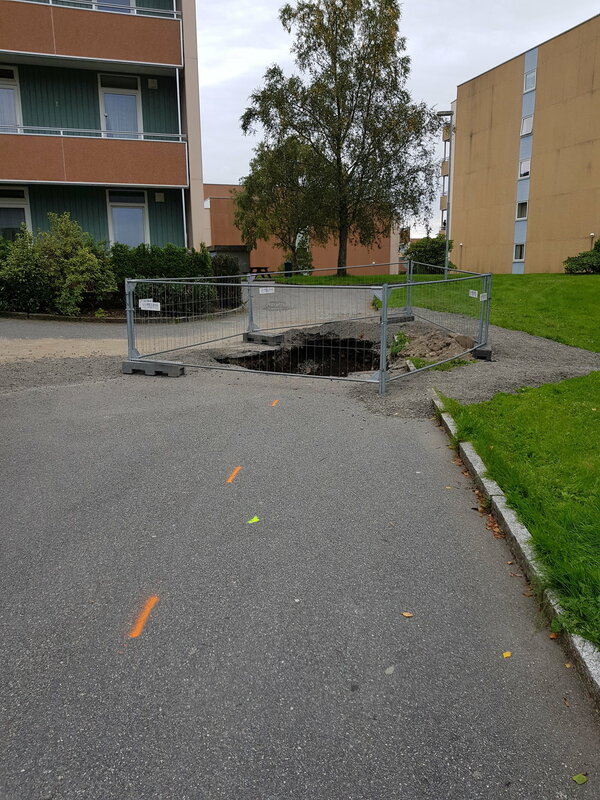 I live in one of the suburbs, Fyllingsdalen, a mere 10-20 minute bus ride into town, depending on time and route. It's a trip I take a lot because I love going to "the city". Mt Løvstakken, watching over Fyllingsdalen, one morning. In front, the local mall on the left and an apartment building on the right. This is what I see on my walk to work. 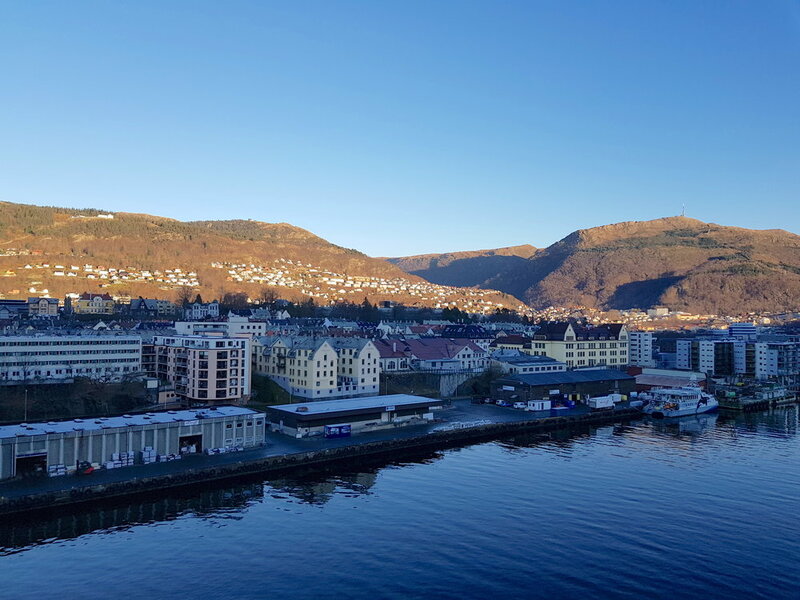 Downtown Bergen is the big draw for me: Tradition, cobblestones, bars and restaurants and the easiest place to meet friends from other suburbs. But before you get to that medieval city center, there are the more modern edges. 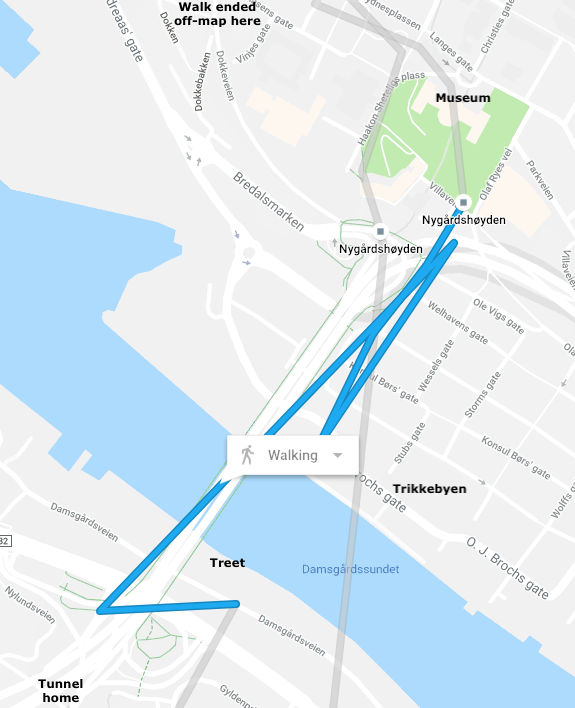 Two of them—a 2 km tunnel (Løvstakktunnelen) and a bridge (Puddefjordsbroen)—are the first ones I constantly encounter going to town. So on a lovely late autumn afternoon two months ago, I got off the bus right after the tunnel. First thing you see starting up the bridge that goes across the Puddefjord is one our newest apartment buildings, and is (as of this writing) the tallest modern structure made out of wood, named Treet (The Tree or The Wood as in what a tree is made of; wood for burning is "ved"). All I can think is that there's not much privacy on those balconies; you can see everything, including the beginnings of hoarding. They do have an awesome view of Damsgårdssundet, Damsgård sound. On Treet's side of the sound (south side) is a neighborhood built mostly after WWI in one of the city's earlier suburban sprawls. Across from Treet is a mix of newish and not so new apartment buildings, several built by union members for union members, also from a good 100 years ago. 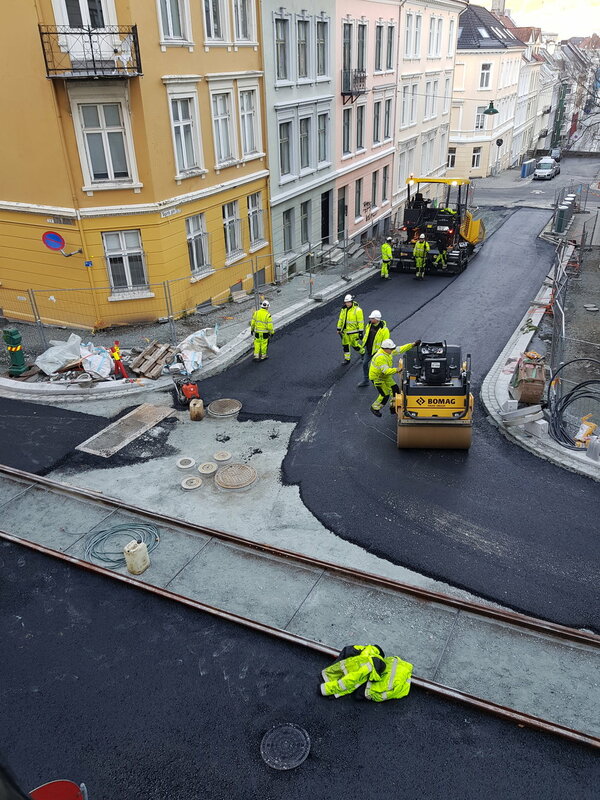 Hence the little neighborhood called Trikkebyen, "Street Car Town" on the north side of Damsgårdsundet. The fjord continues to Solheimsviken, an old industrial area, now all modern office buildings. And of course, off in the distance, our tallest mountain, Ulriken (642 m). From here, I go up the stairs from the bus stop at Møhlenpris (optionally, up the hill under the cultural history museum). 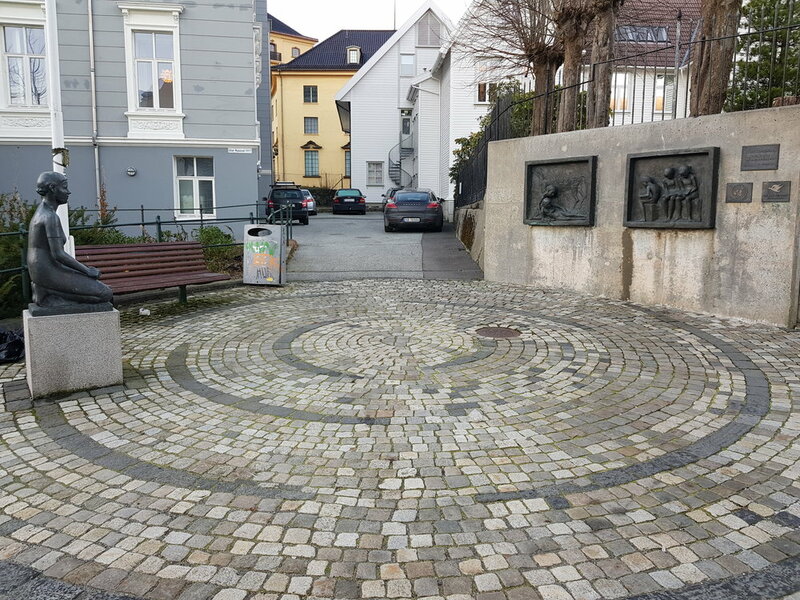 At the top of the stairs is our Human Rights Square, next to the human rights organization the Rafto Foundation. 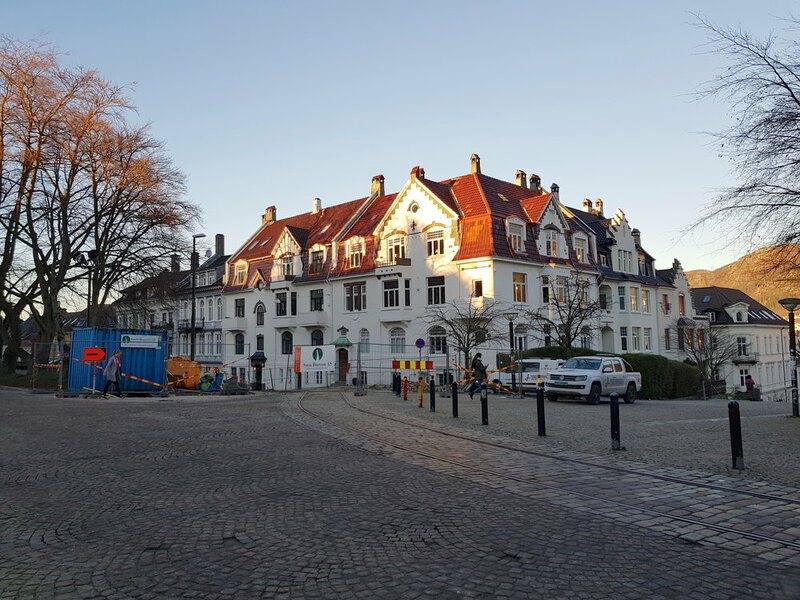 And now we get into what is now considered downtown Bergen, but even this area is a relatively new development, not being part of the original downtown area, but one of the first extensions of the city. We are now near the university, museums and where the rich first built modern (for that era) homes on this side of the city bay. The original botanical gardens are also here, currently in hibernation. And then we get back down into one of the older parts of town again. 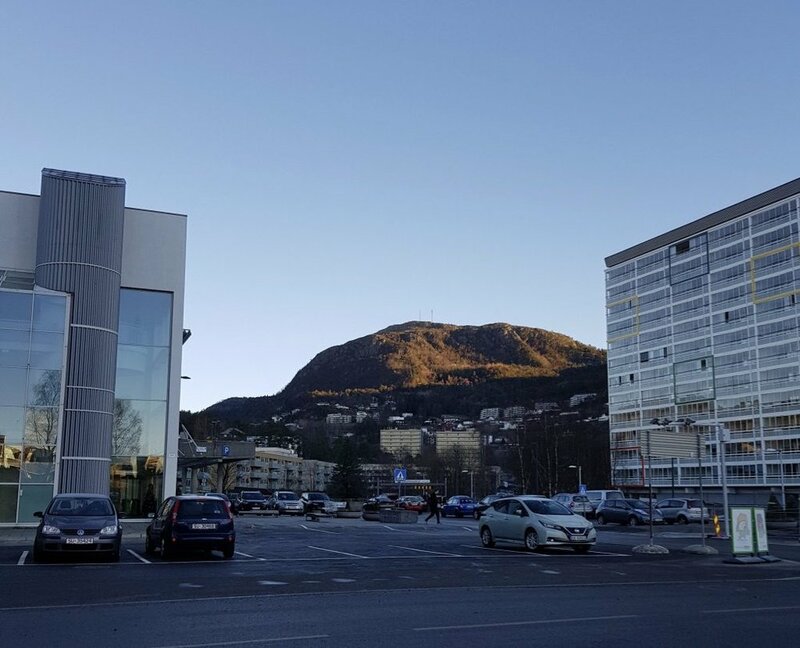 The neighborhood between the university and back towards Puddefjorden is called Sydnes (South Point). 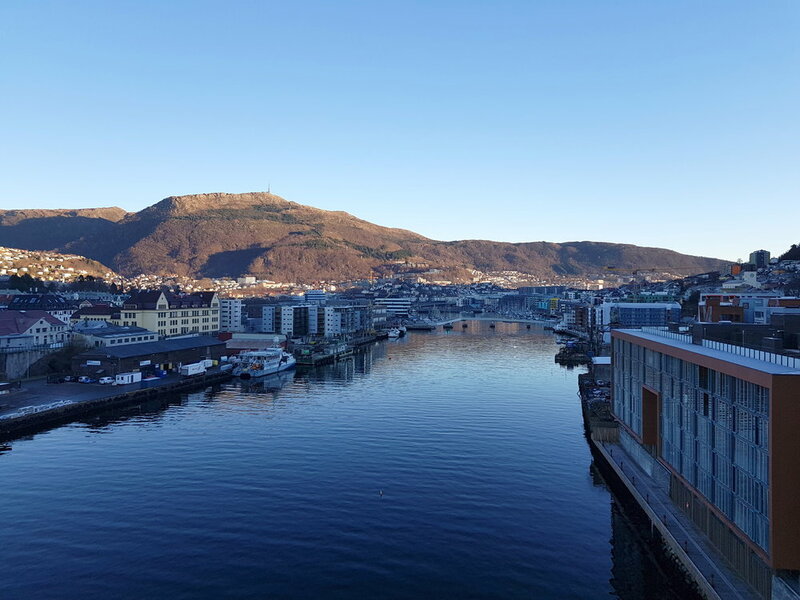 This is one neighborhood that still has the charming jumble of small wooden houses and cobblestoned streets that Bergen is known for. I have seen the plans for the light rail station coming to my bit of the 'burbs. 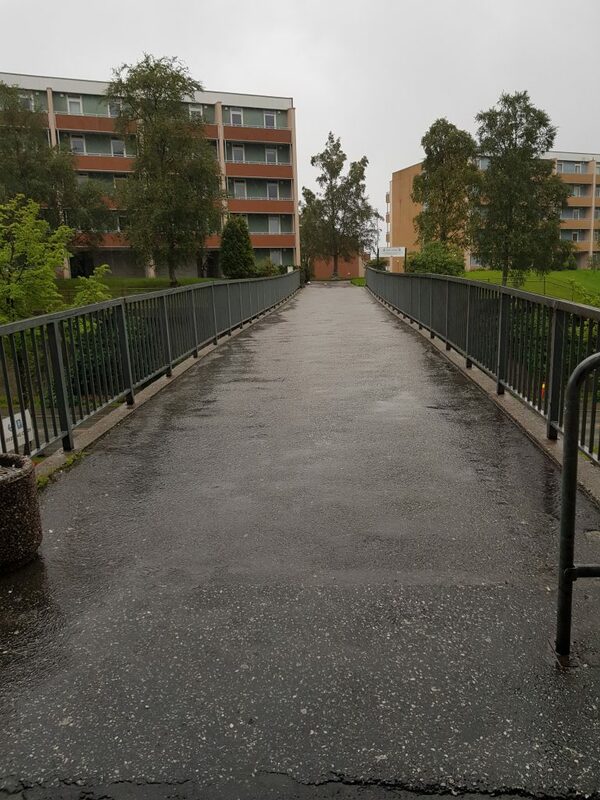 I know that the footbridge I have crossed to and from work since 1986 will become history and I'll get a new bridge about 50 meters to the west. It may happen sooner rather than later. At some point, the slope this bridge connects me to, where the trees are, is going to be dug into and reshaped. A new path to a new bridge will appear, forever changing my walk to work. They're still moving pipes and stuff around underground. In school we learned that what makes a rain forest a huge and dense forest is, well, the rain. Alaska actually advertises its soggy and mossy pine forests as northern rain forests. I've wondered why Norway doesn't do the same. In the summer, this wet country is as lush as a tropical rain forest. Anywhere from 18 to 24 hours of daylight in the middle of summer and a lot of rain makes everything grow incredibly fast. We don't have the tall, dense canopies of the tropics; our denseness tends to be closer to the ground. But the huge number of trees, the millions of leaves, create a solid green along roads, up mountainsides, across vistas, and around my local pond. Summer where I live has been cool and wet. Nature seems not to care. The moment the ground thaws and temperatures stay somewhere above 10 C, stuff grows. Norwegians with lawns find themselves a bit frustrated: All the rain makes the lawns grow fast, but all the rain makes it impossible to mow said lawn. What we learned early in school about plants thriving on sunlight and water is never clearer than when looking at the lushness of my local pond. The combination of blue and green, of water and leaves, is always attractive and calming to humans. Never more so during an undisturbed moment, viewed through thick foliage on a late summer's day.